Would have put money that Jeudy would have been in there. I think Jeudy is the most dangerous with the ball in his hands but I guess he doesn't catch a lot of short passes. If you can, why not run past them and catch it 40 yards down the field. I mean, he is, but he's also taken quite a few slants to the house. And even being a "deep threat" he still runs an additional 30 or so yards untouched. I was responding to the OP. 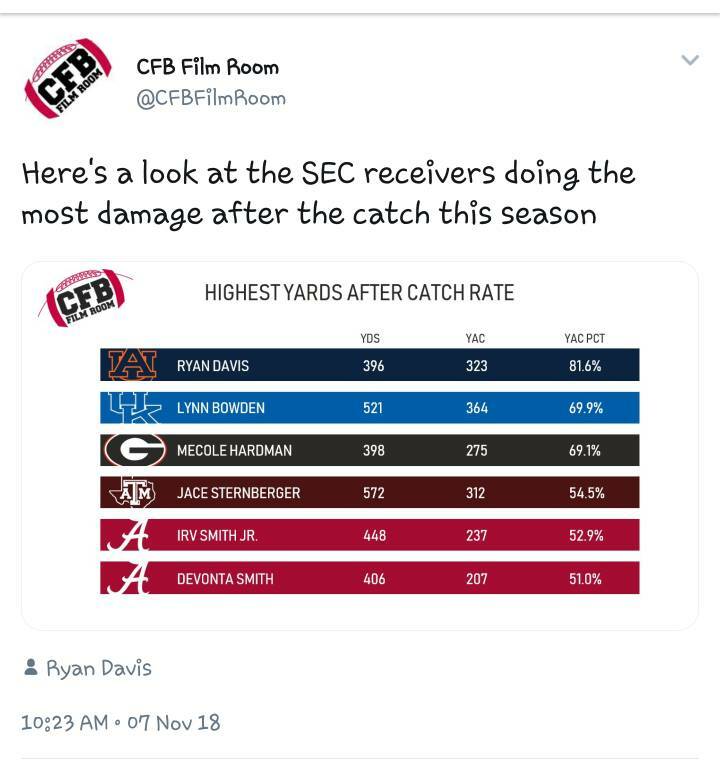 This stat just means that the receivers at the top are catching the ball at or near the LOS. You don't want wide receivers having a 50% stat line here. That is fine for RBs, slot receivers and TEs, but not for WRs. When the number is higher than 50% for a WR, it means that his offense does a poor job getting him the ball down the field. The one thing that makes Jeudy so dangerous is the guy doesn't slow down when he's about to make the catch or when in the act of making the catch. He literally rarely slows down or "breaks stride". Then add to that his sick ability to stop on a dime, change directions and get back to full speed?! He carved up LSU with 8 catches and 103 yards, 12.9 average. He basically made a first down on every reception. Not too shocking to me when all your catching is TDs, well mostly. When you catch a bullet that just traveled 60 yards, there is usually not much field left in front of you. Last edited by Elefantman; November 7th, 2018 at 11:52 AM.